To support our commitment to providing the very best quality, Gecko supplies and unsurpassed guarantee on it’s synthetic grass products of up to *10 years on both the product and installation. 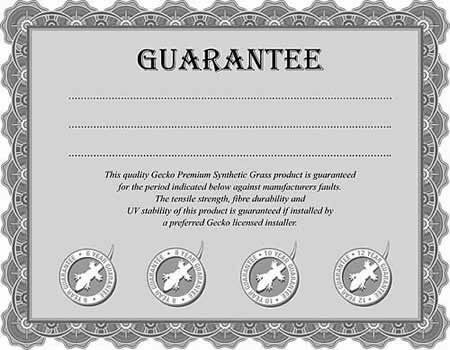 In order to offer the unprecedented guarantees provided on their synthetic grass products, Gecko prides itself in it’s continuous “Installer” training program. This program brings to the classroom table the latest installation techniques from around the world. Many of our installers who are independently qualified Landscapers, Arborists and even Builders look to Gecko’s training regime as ‘cutting edge’ which in turn provides our clients with quality class product and installation and promotes our confidence in issuing our high level guarantees.